A Highly Unique Toastmaster Meeting! Thinking of attending our meeting for the first time? Guests are welcome at no cost! 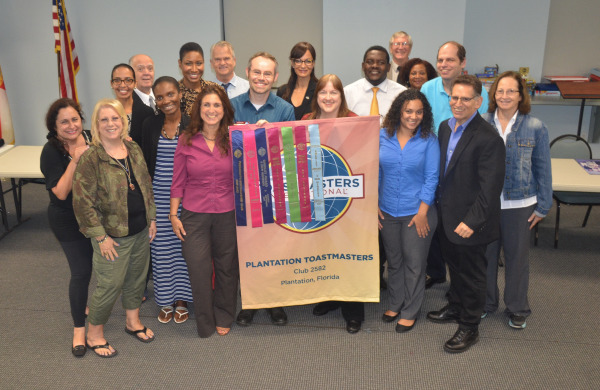 Toastmasters is a place where you develop and grow—both personally and professionally. You join a community of learners, and in Toastmasters meetings we learn by doing. Whether you’re an executive, stay-at-home parent, college student or a retiree, you will improve yourself; building skills to express yourself in a variety of situations. You’ll open up a world of new possibilities: giving better work presentations; leading meetings—and participating in them—more confidently; speaking more smoothly off the cuff; even handling one-on-one interactions with family, friends and colleagues more positively. The environment in a Toastmasters club is friendly and supportive. Everyone at a Toastmasters meeting feels welcome and valued—from complete beginners to veteran speakers. In a club meeting, you practice giving prepared speeches as well as brief impromptu presentations, known as Table Topics. There is no rush and no pressure: The Toastmasters program allows you to progress at your own pace.